There are few practices as stupid, simple and damaging to the environment as wasteful packing. 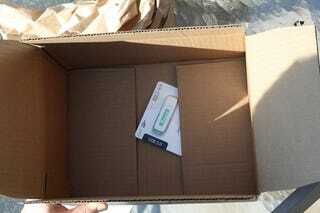 Take a look at this ludicrous box that Dell used to send a 2GB thumb drive. It's about 100 times too big, and it's not just wasteful because of the cardboard used. I, for one, am sick of seeing crap like this. Such idiotic shipping practices also waste space on trucks and planes, requiring more trips, therefore more fuel used and more pollution. And it's not like this is something that we haven't seen Dell do before. Think about it: how many thumbdrives could fit in a UPS truck in boxes like these? What about if they were in boxes that were sized more appropriately? There would be a huge difference. And with most online retailers shipping like this, it's a problem that could be easily solved.